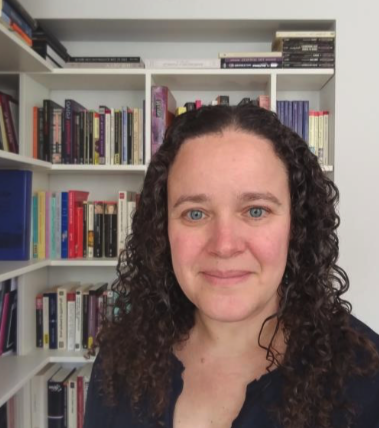 The European Shakespeare Research Association (ESRA) and Cahiers Élisabéthains are delighted to announce that Dr. Delilah Bermudez Brataas is the winner of the Mariangela Tempera Award for Shakespeare on Screen 2018, with an essay entitled "The Shadow's Shadow, or Gendered Ambition in Svend Gade and Asta Nielsen's 1921 Hamlet". The winning essay will be published in the April 2019 issue of Cahiers EÌ�lisabeÌ�thains, and the award formally delivered at the next ESRA conference (Rome, 9-12 July 2019 - http://esra2019.it/). The award ceremony will celebrate the continuity of that passion for Shakespeare on screen that made Mariangela Tempera an inspiring precedent for many researchers in the field, and especially for those in the early stages of their careers. Delilah Bermudez Brataas received her PhD in English from Tufts University in Massachusetts with a dissertation entitled "Shakespeare and Cavendish: Engendering the Early Modern English Utopia." She is currently an Associate Professor of English at the Norwegian University of Science and Technology in Trondheim, Norway, in the Faculty of Education. Her research interests include aspects of gender in utopia from its earliest expressions in early modern literature to its contemporary incarnations in science fiction and fantasy. Her latest article on film and adaptation, "The Alternating Utopic Revisions of The Tempest on Film," appeared in Shakespeare on Screen: The Tempest and the Late Romances (Cambridge University Press, 2017). Mariangela Tempera (1948-2015) was a distinguished Italian scholar of English Studies with a particularly active and productive interest in Shakespeare. This interest manifested itself in a broad range of projects and publications, many with a specialised focus on the transformations of Shakespeareâ€™s texts in other cultures and other media. Mariangelaâ€™s media interest culminated in the creation of the largest European research collection of Shakespeare in audiovisual formats, a project realised within the framework of the Shakespeare Centre that she founded at the University of Ferrara. Mariangela Tempera died in late 2015 at the age of 67. Her intelligence, energy and humour will be sorely missed by many colleagues and friends worldwide in an area of study that continues to expand. 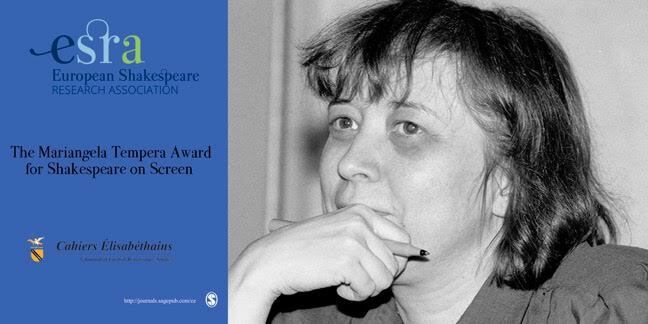 With the Mariangela Tempera Award, the European Shakespeare Research Association (ESRA) and Cahiers Ã‰lisabÃ©thains pay tribute to the groundbreaking work that this remarkable scholar devoted to Shakespeare on screen, and seek to encourage further research in a burgeoning field. The Mariangela Tempera Award is a biennial prize to be awarded to an essay of critical excellence on Shakespeare and the moving image. The essay may focus on film or television, but also on creations generated and circulated in and through the new media. The Mariangela Tempera Award is designed for early-career researchers who have been ESRA conference delegates. The winning essay will be published in Cahiers Ã‰lisabÃ©thains. The author will also be offered a one-year subscription to the journal and a Â£100 book voucher (courtesy of SAGE), and will benefit from a fee waiver for the next ESRA conference.